Okay, I’ve never been a big Thor fan. I don’t dislike him. I just never read much about him, unless he was in a comic with other heroes. 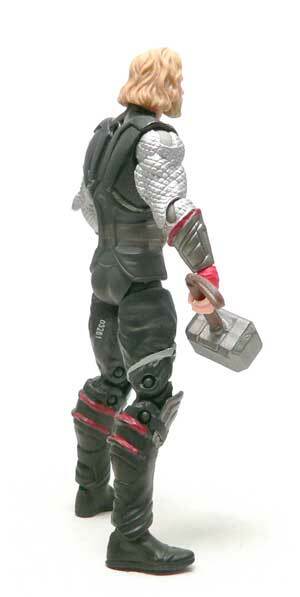 However, much like the Iron Man film did, the new Thor movie has piqued my interest a bit. This time I’m taking a look at “Sword Strike” Thor. Yeah, I know. 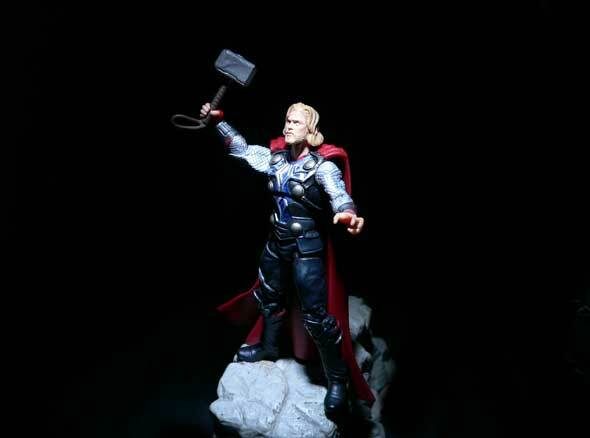 Thor uses a hammer not a sword. 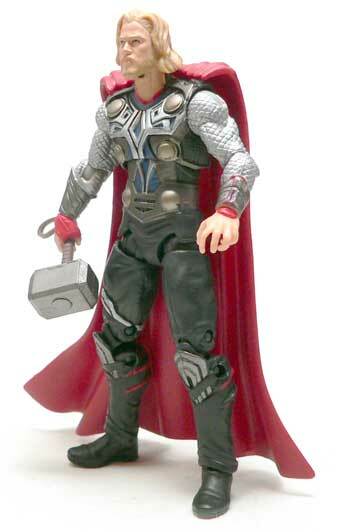 I was wondering how they were going to update Thor’s rather generic comic look into a “real world” costume. When Errex posted his review of the Marvel Universe Thor, I kind of wondered how close to the film version that would be. Turns out, Odin’s son turned out to be closer to the comic book version than I thought he was going to be. I asked Mrs. Nerd for an opinion on the likeness, and she agreed it was pretty good. The thing she mentioned, that I didn’t pick up on until after she said it, was the hair hair line was too straight across. I’m not sure if this is the paint or sculpt or a combination. For a blonde, I think they did a pretty good job of getting a good hair and beard color. Probably a nicer job than most of the Luke Skywalkers for sure. One slight problem I have with the head is articulation. It’s done in a Marvel Legends style joint instead of a simple ball and socket. It doesn’t offer much more range of motion, and its leaves a rather unsightly joint showing on his neck. I wasn’t really expecting much from this figure. To be honest, being the first wave of movie figures, I really figure he was going to be light on detail and articulation and was pleasantly surprised on both counts. Since I haven’t seen the film as of this writing, I can’t tell you if his comstume is completely accurate or not. However, it does seem pretty close to most of the pictures I’ve seen from the film. I was really happy to see they managed to work Thor’s six “dots” into the costume. I wouldn’t have guessed they were part of some sort of lederhosen. Also, the underlying color of the chest is blue to match the comic. I have to say it’s a pretty nice job. The chainmail arms I’m not sure about. They aren’t the worst I’ve ever seen, but almost looks more like thermal blanket material to me. One thing I do really like is the way the boots and knees were done. The shin guards come up over the small articulated knee cap. This is much better than if they have tried to make the top of that guard the knee piece. My least favorite thing about this figure? The left hand. It looks like a bit arthritic to me. Maybe it’s in the film, but I would have thought they could have done something a bit more interesting. Every superhero needs a cape. Well, not every hero, but Thor has one. And it falls a bit flat. It’s a giant red piece of plastic that looks a little plain. Yeah, there is only so much you can do with a cape. The main issue is that it doesn’t sit quite right. It’s attached very loosely by single small peg in between his shoulder blades. This lets the whole thing pivot around so it never quite looks like it is attached at the shoulders. It also does not want to stay attached. Of course with a name like Sword Strike Thor, you know he will come with a sword. 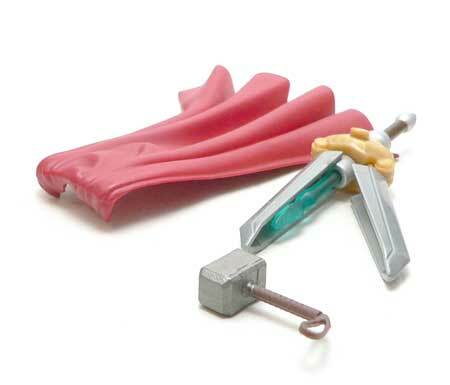 This item looks like some more associated with Eternia than the Marvel Universe. With a press of a button, it splits open and reveals a lightsaber. Maybe it’s just some mystical blue glowing blade. The feature works well, but I will never display it with the figure. However, there is some redemption. He also comes with a pretty cool representation of his hammer, Mjonlir. The piece is solid with a nice subtly metallic paint job. There’s no mistaking what it is. Interesting figure. 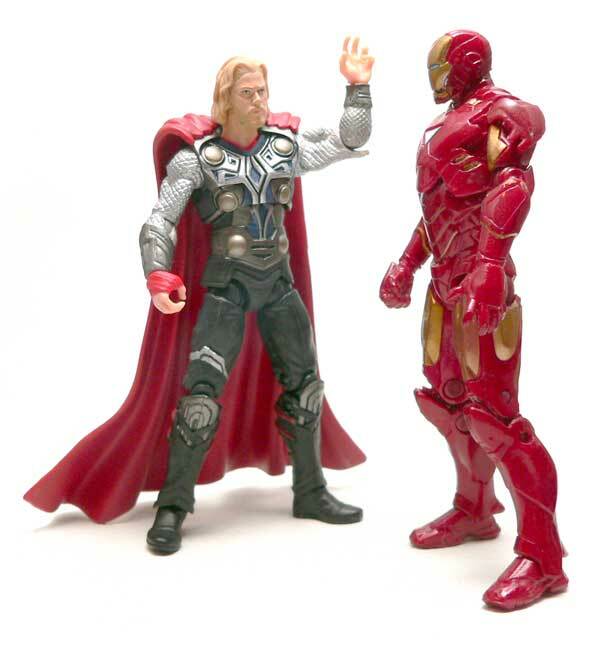 I am still unsure about getting any of the first wave movie Thors, but this one looked like a very probable candidate until I read about the cape. Might as well go for the cape-less version instead. I looked at the capeless one yesterday. He had bare arms and didn’t have the “dots.” He also had strange small red sculpted pieces where the cape would be attached. Just didn’t like it as much.